Healthcare providers today are principally concerned with two things: providing quality care to patients; and getting paid for that care. But in an environment of high deductibles and evolving payment models, healthcare providers need payment clarity – visibility into when and how much they will be paid, by whom, and the ability to better navigate the many obstacles to payment. Want to learn more about the tools and processes that can drive payment clarity? 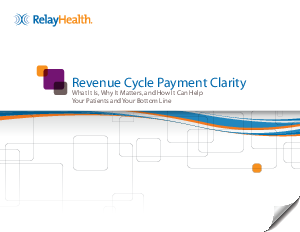 Download the new whitepaper from RelayHealth Financial and find out how it can help you blaze a clear path to a strong revenue cycle.